Gotta use Tor browser properly right? Yeah, being anonymous while surfing online is a great idea. 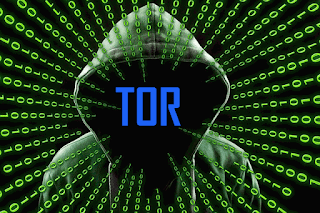 Tor is arguably the most popular onion browser out there, being able to run on Apple MacOS, Microsoft Windows and GNU/Linux(without installing any software). Tor browser protects your anonymity by bouncing your communications around a range of distributed networks of relay runs by aides all around the globe: it prohibits and ensures that somebody watching your Internet connection does not learn what sites you visit, it prevents the websites you browse through from knowing your physical location, and also lets you visit blocked websites. Nipe simply put, is a script to make Tor Network your Default Gateway. 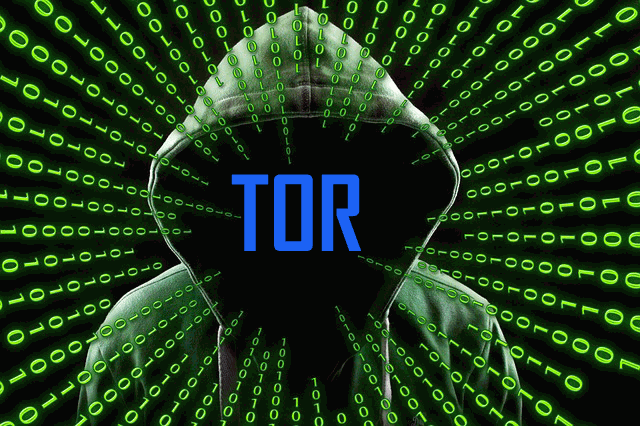 computer to the Tor Network. without any worries of being tracked or traced back. THE best free hacking games for android and ios? Hacking has always been a fantasy worth exploring for many people. A lot of those people get to actually learn and work on their hacking skills, but only a few reach the great height of a pro. Hacking is a serious profession. 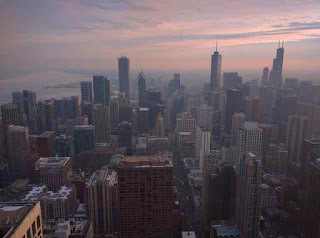 It is always portrayed by many to be all doom and gloom but isn't so. To better understand hacking and have fun while doing so, you might wanna try your luck against real-life world hackers in games. The below Android and iOS games help you take a break from the numerous security threats all around and have you a little fun. From the splendid VR environments, to tower defence strategy games. These free mobile/tablet games will stretch your already existing imagination and possibly even your hacking skills. In this game, users face off against each other by continuous attempts to crack into bank accounts or other accounts in order to upload viruses into the system to generate funds to further their hacking efforts. Hacking into other hackers devices grants you access to spy on other players and then cover your tracks through manipulation of logs. Players get the location of opponents by scanning and identifying IPs with the help of a Firewall. The better the discrepancy surrounding these levels, the less likely a particular hack will be successful. Hack Ex makes use of in-game currency (Bitcoin) to purchase and equip new hacking gadgets and superior smartphones. A player can pay as much as he likes for this game. But even without paying a dime, one can still enjoy the whole game without limitations. Hacker's Quest is basically an addictive text adventure that requires great hackers to reveal dark secrets. Inspired by the popular Linux shell brand, your smartphone gets to turns into a hacking terminal in an instant. You'll get to know plenty individuals and firms - some will be good and others evil. Always listen to your own knowledge of human nature and put trust in your IT skills to grab this thrilling adventure. Perform well and you'll be a big boy in this virtual world. This game is a much more realistic depiction of the hacking world than most with a great deal of social engineering instead of pure hardware and software getting the job done. Basic knowledge of terminal commands will make the early levels a little too easy, but with awesome 55 levels of hacking, there is still plenty to really test your skills. A big apology to great hackers out there, but Cyber Hacker is the nearest thing to an actual hacking environment you will find on Android or iOS. With a rating of 4.6/5.0 on App store, the game is basically puzzle solving with lots of password cracking, virus uploads, DDoS attacks and a beautiful dose of social engineering. It begins with you as a freelance hacker taking jobs for Bitcoin. Even at the very beginning, the threat of Interpol tracking you down is ever present. Techniques, like remembering the various structure of file systems and adequately phishing employees before attempting a hack are vital in the game. You also need to take proper advantage of all the tools available (definitely take the tutorial). While this game is still a less version of hacking, it provides a more complete picture than most games of the same genre. Ever wanted to be somewhat a hacker? Crack into the very heart of a mysterious organization to uncover their darkest secrets. Hack RUN® uses 'old school' commands (like UNIX or DOS) that simulate a real-life OS. Learn and master the command prompts of each system in order to navigate through your adventure. This gaming series is a text-based interactive storyline that has begotten five series on iOS, with the first two available on Android. All the series follow the same structure: the player with the help of a terminal interface will try to hack into the various accounts of employees within the mysteriously RUN organization. The game really is about puzzle solving as you seek to decipher valuable data in emails and websites within the system. While this game isn’t going to be for you a path to hacking greatness, the storyline is engaging and the developer doesn't seem to stop churning out sequels to keep fans engaged. Try your best to outsmart other hackers and level up your reputation as the best geek around in vHack XT. If you're one of those that enjoy some social interaction in their games, then you're in luck because this game is one of the few hacking games that offer this functionality. Players can chat with one another and “cluster” allows a maximum of 10 players to work together and create an in-game private chat room. To successfully hack, players scan for target's IP location and compare their stats to the target to determine the possibility of success. While vHack XT isn’t the most visually appealing of the games in this genre, it offers an addictive gameplay along with an active community that will always bring you back. One of the best free hacking games out there, Hackers pits you against various real-world hackers in a towerlike defence style strategy game. The darknet has never been so widely accessible! This high-end cyber combat interface helps you to research important programs, fight for your nation in the First World Cyberwar and build your hacker's prestige. Players build up their own type of network while acquiring and upgrading tools to attack targets either via stealth with three known distinct mission types or through brute force attack. Note that while all the above-listed games can bring you closer to what hacking looks like, they don't accurately depict the real world of hacking. Wanna know all the stuff you need to know about Man in the middle(MITM) attack? including the basic concepts, types, prevention, etc. If your answer is yes, I suggest you read further. What is Man in the middle attack? Different forms of MITM attack? 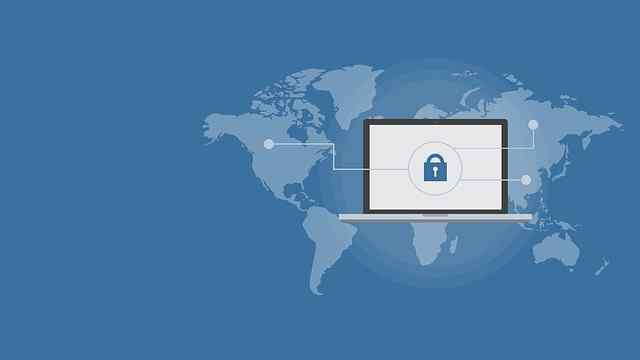 What are the types of MITM attack? How do I prevent a MITM attack? To better understand this concept, you'll be reading this from a victim's perspective rather than the attacker. Pay attention! 1. What is Man in the middle attack? 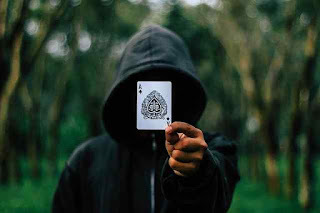 A man-in-the-middle attack is a known cybercrime where a malicious actor secretly inserts himself into an online conversation between two individuals(sometimes more), impersonates both parties involved and accesses information that is being sent by the two parties to one another. This type of cyber attack basically requires three players to be carried out; the victim, the individual/s the victim is trying to communicate with, and the hacker(Man in the middle), who ’s trying to intercept the victim’s communications with the purpose of getting critical information. Note that the victim in this scenario isn’t aware of the man in the middle. A practical example of a MITM attack is active eavesdropping. In this example, the hacker attempts independent links with the victims and conveys messages between them, making them think they're communicating directly with each other over a secure private connection, when in truth, the whole conversation is being controlled by the attacker. Sidejacking - This involves sniffing of data packets with the purpose of stealing session cookies and in the process hijack a user’s session. These cookies login information in some cases are unencrypted, even if the website was secure. Evil Twin - This can be called a rogue Wi-Fi network appearing to be from a legitimate network. When a user joins a rogue network, an attacker can launch a MITM attack, thereby intercepting useful data sent between you and the network. Sniffing - This is when a malicious actor uses a readily available tool or program to intercept data being transmitted from or to your device. 2. How does Man in the middle attack work? How does this work? what actually happens in the background is that the hacker manages to have some form of control over the network topology thereby being able to insert himself in-between the client and the server. Address Resolution Protocol(ARP) is another interesting example. This is used to map a network address to a physical address like a MAC address. An IPv4 address is an example of the network address. Check out the ARP cache of one’s computer system. ARP comes with a flaw though, it being that you can't verify that the ARP packet is telling the truth. The Router asks, “Who and where is 192.168.1.103?”, a system at 192.168.1.105 replies, “192.168.1.103 is at ff:ff:ff:ff:ff:ff (192.168.1.105’s MAC)”. The router doesn't know that this packet is coming from a totally different system. For the router, 192.168.1.103 is 192.168.1.105. This is known as ARP spoofing. So what basically happens in a man in the middle attack is that the attacker continuously sends ARP packets to the victim claiming that the attacker’s system is the router. The victim’s computer goes ahead and sends all the packets to the attacker’s computer, all the while thinking it is actually the router and the attacker then forwards those messages to the actual router. Editing and taking the information he needs in the process. There’s a more complex and sophisticated MITM attack involving Border gateway protocol(BGP) where you can divert the routing to the internet for an entire domain. An example? Let’s say your friend receives an email that seems to be from his bank, encouraging him to sign into his account dashboard to confirm his contact information. He clicks on a link(saying maybe click here to sign in) in the email and is redirected to what looks like his bank’s website. Then he signs in and carries out the requested task and in the process unknowingly giving out his info. In this scenario, the MITM sent your friend the email, making it appear to be legitimately from his bank. This particular attack involves phishing i.e tricking him to click on a link in the email that appears to come from his bank. Let's say Debra and Justice are having a conversation online; Mary intends to eavesdrop on the conversation but at the same time remain transparent. Mary could tell Debra that she is Justice and tell Justice that she is Debra. This would consequently make Debra believe she’s currently texting Justice while revealing her version of the conversation to Debra. Mary then gathers needed information from the conversation, alter and twist the response, and pass the message across to Justice (who still thinks he’s having a good talk with Debra). As a result, Mary transparently hijacked their entire conversation. 4. Real life instances of a MITM attack? MITM attacks are of two forms; one that involves malware, and another that involves physical proximity to the proposed target. The first form, just like the fake bank scenario above, is also referred to as a man in the browser attack. With a MITB attack, the attacker requires a way to inject malicious programme into the victim’s computer system. This can be achieved by conducting a phishing attack. The malware installs on the browser without the user ’s consent and knowledge. The malware then records the data/information sent between websites and the victim, such as online shops, and forwards it to the attacker. Going back to the forms of MITM attack. Hackers execute a MITM attack in 2 phases — interception and decryption. 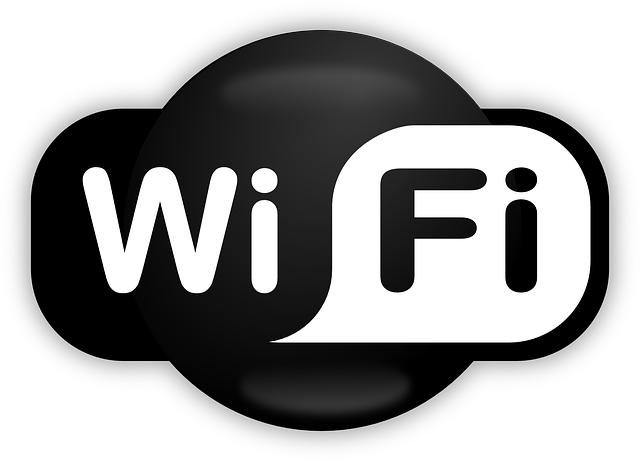 In a traditional man in the middle attack, attackers need access to a vulnerable Wi-Fi router. These types of connections are likely to be found in public places with free Wi-Fi hotspots, and in some cases, in some people’s homes, i.e when they fail to protect their network properly. Attackers will go ahead to scan the router in search for specific vulnerabilities such as a weak password. A successful MITM attack doesn't stop after it intercepts. 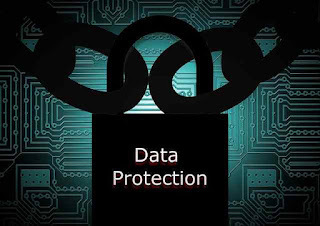 The victim’s encrypted data needs to be unencrypted, that way, the attacker can read and act upon it. 6. What are the types of man in the middle attack? Each computer online has an internet protocol (IP) address, which is somewhat similar to the street address of your home. By spoofing an IP address(changing the IP), a hacker is able to trick you into thinking you’re interacting with someone or a website you’re not, probably allowing the attacker to have access to sensitive information you’d otherwise not share. Domain Name Server(DNS) spoofing is a type of MITM attack that forces a victim to a fake website instead of the real one the victim intends to visit. Victims of DNS spoofing think they’re visiting a safe, trusted site, instead, they’re unknowingly interacting with a fraudster. Here, the attacker's mission is to divert traffic from the real website and capture user login details. When doing online transactions, be on the lookout for “HTTPS” in the website URL, rather than “HTTP”. This shows that the site is secure and trusted. A hacker can trick your browser into believing it’s visiting a secure site when it’s not. Connecting to a secure and trusted server basically means standard security protocols are in order, protecting all the data you have in common with that server. SSL is short for Secure Sockets Layer, a protocol that sets up encrypted links between the web server and your browser. In an SSL hijacking, the hacker uses a different computer and a secure server to intercept all the data passing through the server to the user’s computer. Attackers can target email accounts of financial institutions like banks. Once access is gained, they are able to monitor transactions between the customers and the institution. The attackers can then decide to spoof the bank’s email address and email to customers. This convinces the victim to follow the hackers’ instructions instead of the bank’s. As a result, an unwitting victim may end up sending money to the attacker. To better grab the concept of a stolen browser cookie, you first need to understand what one is; a browser cookie is simply a piece of information a website stores on your computer system. online retailers like Amazon might store the personal info you enter and cart items you’ve selected on a cookie, that way, you need not re-enter same information when you return. A hacker can steal your browser cookies and gain access to sensitive information. 7. How do I protect my system from a MITM attack? Having a very strong encryption mechanism on wireless access points(WAP) helps prevent unwanted persons from connecting to your network. A somewhat weak encryption mechanism allows a hacker to easily brute-force his way into a network and starts MITM attacking. The stronger the encryption, the safer. VPNs is used to create a secure browsing environment for information within a LAN(local area network). They create a subnet using key-based encryption for secure communication. If this is done properly, the attacker will not be able to decipher the traffic in the VPN even if he happens to get on a network that is shared. HTTPS is used to safely communicate over HTTP with the help of public-private key exchange. This helps prevent an attacker from making sense from the data he may be sniffing. Webmasters should not provide HTTP alternatives. A man in the middle attack involves spoofing something. RSA public key pair authentication can be used in numerous layers of the stack in ensuring that the people or website you are in communication with are actually the people you want to be communicating with. It is all scary from a victim's perspective of man in the middle (MITM) attack. Sometimes times the fear is due to knowing little or no info on the topic. After reading through this, most users might panic with the knowledge that they have been keeping their devices vulnerable and might have fallen victim to an attack. The best thing to do in such a scenario is to keep calm. Join us on facebook if you appreciate this post. Is it really possible to use a smartphone as a monitoring device without any knowledge of I.T? The short answer is YES. You don't need any sort of Cyber training to use your smartphone as a spy device. How is this practicable? By installing necessary security applications and using them in the manner I'll show you as you scroll down the page. What you're about to read further is common sense for some experienced individuals, but alien to many. For the experienced ones, I'll gladly welcome any form of contribution to the methods I'm gonna use here. For the not-so-experienced, read on! To kick this off, you need an app used as a security camera. Most such app offers the same features as; cloud streaming, motion detection and alerts. local streaming and recording/storing footage locally or remotely. Despite lots of options online, the best for me is IP webcam. Now the pro version cost $3.99 to unlock all features, but there's also a free-to-use version. Though this version can't be compared to the paid one, it still got some cool features. IP Webcam broadcasts both over the cloud and locally with the help of a service called Ivideon, so you can watch your stream, live from anywhere. Get the Ivideon app for android on Playstore. In short, IP Webcam is used for videoing and Ivideon for streaming. 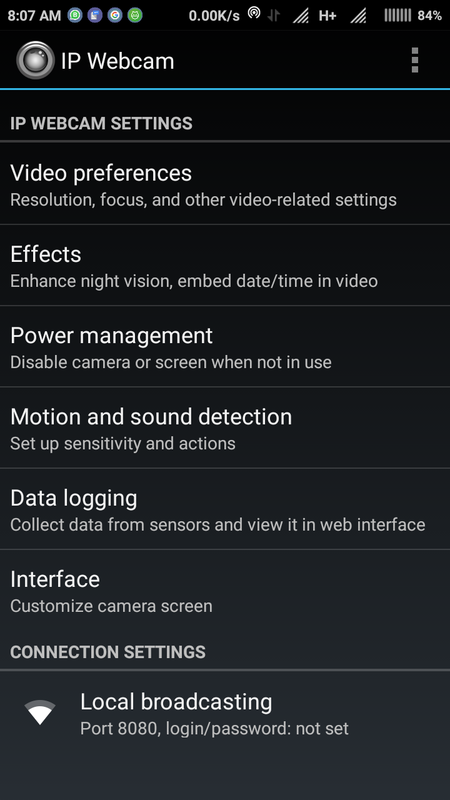 Set your video preference, effects, power management settings, and motion and sound detecting. Go to Local broadcasting>>login/password to set up your unique login details when streaming locally. Streaming locally is public. Reason why you should have a password. That way only you can stream your video. Now, to broadcast the stream remotely, you have to register or log in to Ivideon(if already registered). Locate cloud streaming from your IP Webcam app, then select Ivideon and log in to connect your Ivideon account to the IP Webcam. 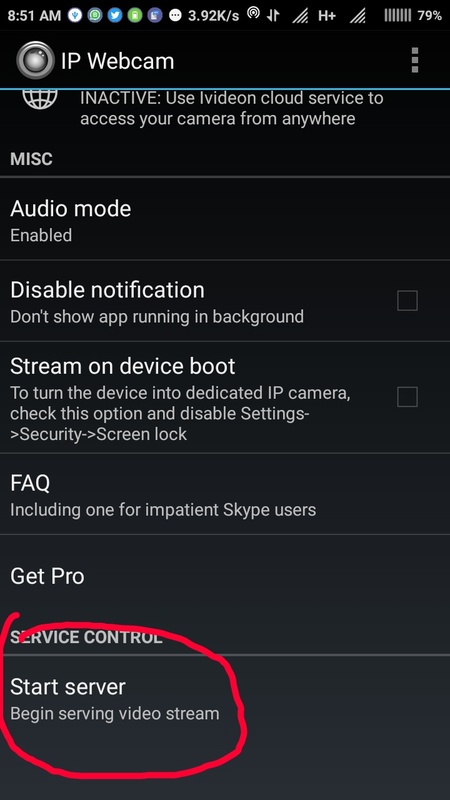 To begin streaming, select Start server at the very bottom of the app of your IP Webcam. you'll see an IP at the bottom of the video like https://192.156.43.1.7070 type it in the web address bar of your pc or phone. It'll tell you insecure url but don't worry since you have your own dedicated password. Continue with the login. A pop up will show asking for your username and password. After successful login, you'll be directed to your dashboard. Locate Video renderer and select Browser to start streaming. To do this is very simple. 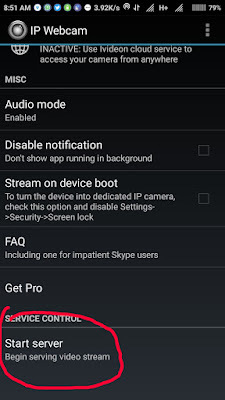 Start the server in your IP Webcam(you must have linked your Ivideon account to IP Webcam by now), then login to your Ivideon account from your pc/desktop/android. You'll see a thumbnail of the current stream. Click on it and watch. Choosing the best spot to place your phone is very challenging as you'll be careful to make sure it won't fall off or get seen. You may wanna position it at the main entrance to your home or wherever you think might be particularly vulnerable. You can also set up an IP camera as a baby monitor. 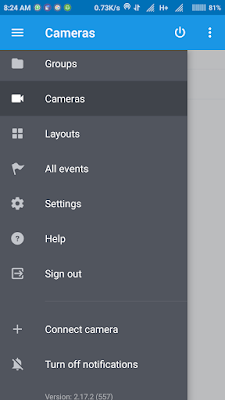 If you have multiple old phones lying around, you can set up multiple cameras for fairly robust video coverage if you have multiple old phones lying around. To mount the camera, a little smartphone tripod or suction car mount works perfectly and helps you fix the android in an inconspicuous place. Note that streaming takes a lot of power since the phone will be turned on for a long time. To solve this issue, you might wanna position the phone close to a power source. A long Micro-USB or lightning cable will add some flexibility to your camera positioning. Make sure you put your phone on silent. Putting it on airplane mode is advisable. Don't forget to on your wifi right back in order to access the internet. Hopefully, by now you should know all you need to know on how to use your android phone as a security camera. You can go ahead and monitor your household when you're not at home. No one can deny that the Internet is a massive and vast part of so many people’s everyday lives as it is quite useful, fun and informative. Be noted – no matter how safe you feel when using it, you gotta secure your safety. 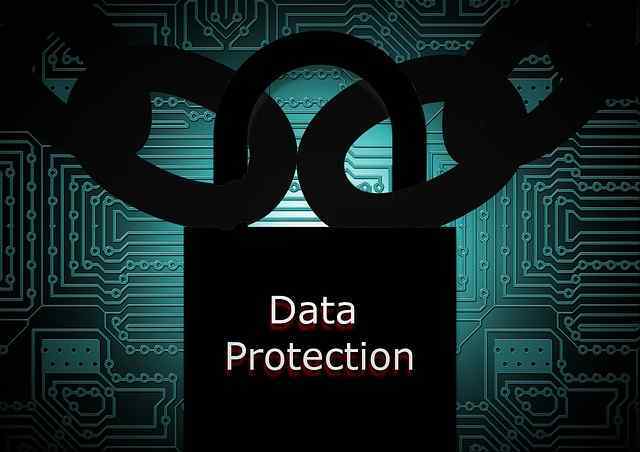 Good news is that you can protect your identity and information for years to come by getting into a habit of using good Internet safety practices. 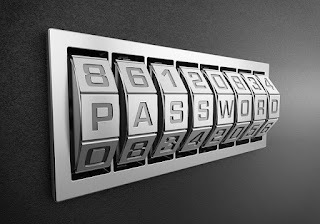 According to the survey in 2016, around 4% of people used “123456” as their password, making it the most common and easy to crack password of 2016. Creating a secure and strong password is one of the easiest and most effective things you can do to prevent brute force password hacks. Simply, the more bulletproof password, the more difficult it is for hackers to infect your system. Having a strong password is very essential especially now we're living in an era of widespread hacks. 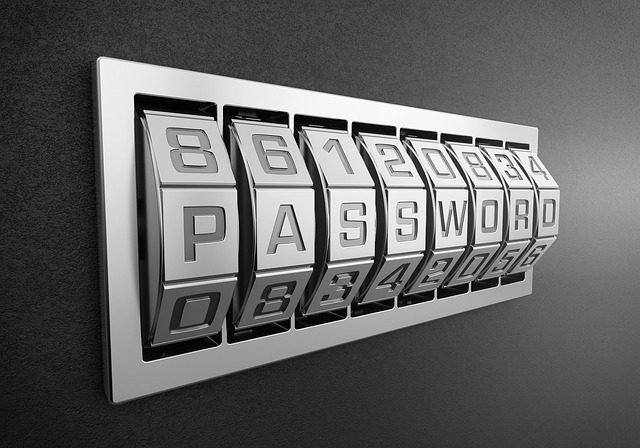 One database breach on a website can reveal thousands if not millions of user passwords. If in such scenario, you use the same password in another website, a hacker can easily trace it and log in to your account. Software security is a battle which doesn’t end and never will be. As susceptibilities arise and security errors are oppressed, whereas developers always patches updating their software and deliver users with better protection. In short, enabling automatic updates means great peace of mind as delaying these updates leaves your operating system more susceptible to an attack. Latest Technology Updates don’t harm your computer or smartphone but keep your operating system, web browser, and other software up to date to reduce the overall risk of a security breach. Taking a two-factor authentication takes your e-safety to the next level, without a doubt. Several well-reputed websites that contain vital financial or personal information such as LinkedIn, Gmail, PayPal, and banking websites has already adopted this measure of extra security. Most of the websites text verification code, while others may send a link in the email for authentication. Whether you like or not, but 2FA is indeed an effective way of preventing fraudulent activities. When at home or in your workplace, you probably make use of a strong password protected router, thereby encrypting your data. When not at home. I bet you love connecting your devices to public Wi-Fi as it doesn’t charge even a penny? Keep in mind that it poses some significant security risks. An example is; Man-In-The-Middle attack is quite common on public Wi-Fi through which hackers get access to your personal emails, and passwords with less hassle. Now that you've read the first two tips before this one and you're about working on keeping your logins safe, also make sure your connections are secure. Tip: While using public Wi-Fi, assume someone is watching you. 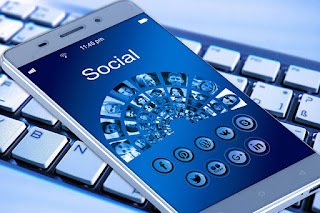 Never enter login details or banking information when connecting but if you do need to send some sort of important information, use a VPN (Virtual Private Network) to create a more secure connection. Antivirus software plays a vital role in helping you stay secure on the Internet. A well-known and leading IT security solution prevents malicious software from entering into your operating system and clean up any issues which might slip past your system’s defences. All you have to do is, enable auto updates and ensure your antivirus settings are suited to your browsing habits and needs. Antiviruses aren't really used by those who are experienced in IT as their are better advanced ways of protecting yourself from online hacks. Notwithstanding, this measure is a great way for the ordinary persons with no knowledge of IT to secure from malitious apps and programmes downloaded on the internet. Now that you’re about putting great tech measures into place, also make sure you don’t invite danger to your system or revealing your details through clicking of suspicious links. Have you ever somehow been on and required to put your login details on a webpage resembling a popular social network or website like facebook? Maybe you've received a spam email saying something like "click here to get blah blah". Ignore such request. This type of attack is known as phishing attack or social engineering, where you're tricked into revealing personal or sensitive information for fraudulent purposes. Another reason you should click smartly while online is the risk of infecting your system with malware. Don't respond to that suspicious message urging you to "click here" or "download this" by reciprocating to the request. When shopping online, or doing sensitive transactions on the internet, always be on the lookout to see if the site’s address begins with “https”, instead of “http”, and has a padlock icon in the URL field saying Secure. This shows that the website uses encryption to scramble your information so it can’t be intercepted by hackers. Also, be on watch for website URLs having bad grammar or misspellings in their web addresses. They're likely to be copycats of legitimate websites created to trick you into thinking it is the actual site you have in mind(like what I talked about on the previous tip). Use this safe search tool McAfee to stay miles clear of risky sites. The internet is never a fully safe nor secure place. Plenty people discovered this the hard way every day and seem not to know how it all happened. Hopefully, these above tips will go a long way in making sure your safety is guaranteed while online. You need to check out the concepts of a Man in the middle attack to better understand this topic. 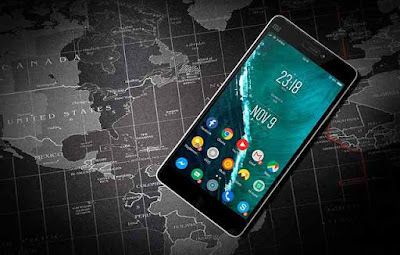 Internet safety guidelines are aside for a short second, we’ve also got you covered if you’re in a search of Cool Gadgets Reviews as well as Latest Updates about Hackers Lounge and Life Hacks. Hi, i'm Justice. I live as a hacker, writer and lover of the written word who keeps alive the music of the language. Helping people become passionate at ethical hacking, tutoring proper usage of the basic tools. Holds head and heart together in the words and writes in hope that one person will be better because he or she reads what I write.